In the world of sports, just speaking the name Tim Tebow is enough to start an argument. Following an undeniably successful college football career, Tebow moved on to the NFL — and that’s where the controversy took off. Despite being widely considered by analysts to be a subpar quarterback, in the 2011-2012 season, Tebow took the reins of a 1-4 Denver Broncos squad and led them to a playoff appearance, which included a playoff victory over the heavily-favored Pittsburgh Steelers. Tebow was traded prior to the following season, played briefly with three other NFL teams, and now plays professional baseball with the New York Mets organization. While fans and critics continue to argue over how good a football player — and now, how good a baseball player — Tebow is, one thing we can all agree on is that some of Tebow’s best work is done off the field. One of the many examples of this is an adoption aid program from the Tim Tebow Foundation. In a new video from the Tim Tebow Foundation, Christine Mullican shares the story of her adopted son, Alex. Alex, who is deaf, had been abandoned at a train station in China. Christine says she had always wanted to adopt, and instantly felt a connection with Alex upon seeing a picture of him and hearing his story. “I knew right then who our son was,” she explains in the video. Christine and her husband Joel went forward with plans to adopt Alex. But during the long adoption process, Joel passed away suddenly. Christine still wanted to adopt Alex, but due to her husband’s death, she was concerned she would no longer be able to cover the high costs of adoption. That’s when the Tim Tebow Foundation stepped in. 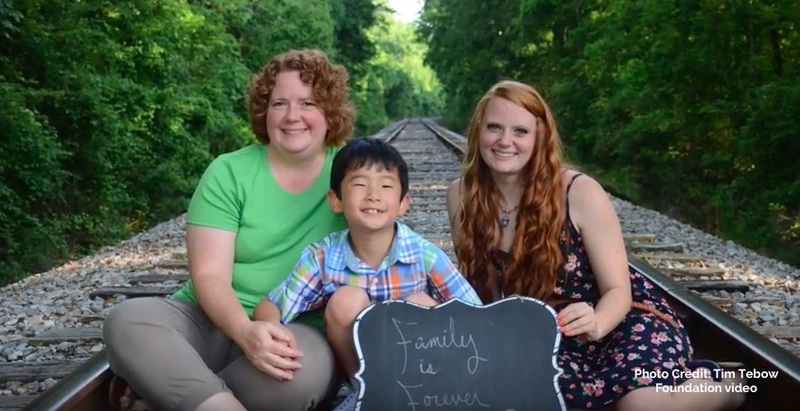 Christine received much-needed help from the Foundation in the form of a grant that made Alex’s adoption possible. At first, Alex seemed very unhappy and scared, Christine says. But after a bit of time in his new environment, Alex began to relax, have fun, and smile. Following the adoption, the Foundation made a point to check up on Alex, texting and emailing Christine for updates. In addition to the initial adoption aid grant, the Foundation provided a second grant to cover Alex’s medical expenses. In addition to its adoption aid grants, the Tim Tebow Foundation helps make the world a better place in other ways, including providing aid to orphans and sponsoring prom nights for students with special needs. Tebow’s mom, Pam, has revealed that when she was pregnant with Tim, doctors recommended an abortion. (Gators fans, Broncos fans, and fans of humanitarian work alike are thankful she refused.) Pam will be featured as a special guest speaker at the 2017 March for Life in January.